At the Bedford College Group we have vacancy for a Manager of Student Well-being & Achievement. So it’s a role requiring a wide range of skills and knowledge. Bedford College Group is one of the largest providers of Further and Higher Education, apprenticeship and part-time training in the region. We have sector beating destination statistics and you can see our CEIAG policy here and our Careers Programme Statement here. If the role is something that interests you, please do consider applying! Released this week was a slew of data on the destinations of 2015 Key Stage 4 & 5 leavers that provides nerds like me hours of interesting noodling about in excel. There’s plenty to get through, not only focusing on the number of students taking up each type of route but also on the characteristics of those students. This post looks at the trend from the data (now going back to 2010, although breakdowns that include ethnicity only start in 2012) in the percentages of KS4 & 5 leavers of different ethnicities going into apprenticeships. The charts below detail both the percentage of all leavers in that year accessing apprenticeships and the percentage of students from each named ethnic background accessing apprenticeships. The first thing to notice is that these percentages are comparatively small compared to other routes. The 6% of KS4 students starting apprenticeships is well below the 38% starting an FE College and another 38% starting a school Sixth-Form. That 6% equates to approximately 34,000 young people while the 7% of KS5 leavers equates to approximately 25,400 students from this age group. from The House of Commons Library. and this year 130,000 under 19s commenced an apprenticeship. This is more than double the (approx) 50,400 combine leavers above which shows that many young people are accessing apprenticeships after the first two terms (the definition used by the destination statistics) after leaving their KS4 & KS5 providers. What seems to be happening though is that the apprenticeship route is failing to find much growth with students from ethnic minority backgrounds straight out of school and college. While their White peers are eking up the percentage of students from that background pursuing this route, the percentage of black or Asian students is either stalled or lagging behind. but that, as a percentage of the total number of students from each of those backgrounds leaving KS4 & KS5, their progression is being outpaced by their White counterparts. The reasons for this are going to be numerous and complex for different groups. In Luton we have a diverse student cohort drawn from the local community and this wider trend in apprenticeship progression is reflected in the 2015 destination figures of the town. Of the four schools with highest percentage of students whose first language is not English (from Icknield High School at 64.9% to Denbigh High at 94.6%), only one reaches a 4% progression rate to apprenticeships while the figures of two of the others are so small they are suppressed to protect confidentiality. There is an attainment factor in play here, all four of those schools are in the top six in the town for academic progress. 86% of Denbigh’s leavers progressed to the local Sixth-Form college. The reasons for this huge majority are not only that these students (and their families) see this route as desirable but that the grades they have achieved make that route available. We also know that, comparably, white working class students (particularly boys) underachieve in their academic progress and so, find academic routes Post 16 harder to access. Does this mean that this ethnic group has fewer routes to pursue, so a greater percentage opt for apprenticeships? Is the fact that the majority of apprenticeships on offer are at qualifications levels perceived to be accessible to (slightly) lower academic achievers but not offering challenge or progression to higher academic achievers a dissuading factor? Another favourite tactic from policy makers when discussing destinations is to revert to the safe waters of “a lack of aspiration” for low progression figures but I’ve blogged in the past about this is a sound bite hiding a more nuanced situation. Could it be that students from White backgrounds actually have greater social capital around apprenticeships and are more able to access the networks of support to gain a foothold into this route? Whatever the reasons, it seems that schools and colleges are not currently impacting on the trend for students from Asian and Black backgrounds to access apprenticeships despite a current, diverse advertising campaign. The numbers of young people of all backgrounds accessing apprenticeships needs to increase but the messages are so far struggling to reach all of the students in our schools. I, as a resident of Luton, write to voice my support for the submitted planning applications from 2020 developments for the schemes at Power Court (REF: 16/01400) and Newlands Park (REF: 16/01401). I’m certain that many of the supporting emails you have received for these two applications have started with heartfelt tales of the length and depth of the author’s support for Luton Town Football club. This will not be one of those emails. I have no need to recount the magic wand that was Jean Louis Valois’ left foot or how I once saw Steve Howard at a restaurant in London but was too frightened to ask the big man for an autograph because I thought he’d be annoyed and I’d seen how he’d bruised opposition centre halfs season after season. This will not be one of those emails because all of those things are all in the past and this email is about the future. I work in a Luton High School as a Careers Advisor. This means my role is at the interface of education and local business. Local young people want to be work ready and local employers want a highly skilled local workforce. For both of these outcomes to be successfully achieved, Luton needs to both be a desirable destination for a range of employers to base their operations and engage with the local community and our young people need to experience the local labour market and aspire to live and work in the area in their later lives. Progress is being made on both fronts. Luton is already home to a number of remarkable businesses that are proud to be involved with the local community and it is also a hugely exciting time in the redevelopment of the town with projects such as Napier Park, the Cultural Quarter and the expansion of London Luton Airport. The local education system is also stepping up to the mark with new schools and facilities opening, impressive Ofsted grades and region beating progression statistics. Both of the developments from the 2020 group would be massively beneficial projects to these aims. I visited the 2020 exhibition at the Hat Factory and was impressed then with the thought and diligence that had gone into all aspects of the proposed sites but, upon reading the online planning documents and particularly the Socio-Economic submission, I am now convinced of the important role the developments could play in the future economic health of the town. The developments align with the aims of the Luton Investment Framework and the growth outcomes of SEMLEP’s strategic economic plan. The mix of retail, office and entertainment space at Newlands Park and the retail and hospitality plans for Power Court will offer a range of business investment. The commitment from 2020 to offer local young people apprenticeship opportunities during the construction phase and beyond will be hugely valuable to offering desirable progression routes and the KPMG estimate of 9,780 full-time roles added to the local economy by 2030 will be highly beneficial to enticing talented young workers to remain in the local area after leaving education. The influx of new companies to the area that take up the spaces will offer new opportunities for collaboration between education and business across the town and so improve the skills base and work readiness of our young people. The economic benefits to both of the developments are clear and these, combined with the proposed spaces dedicated for cultural and social events, will have positive ancillary impacts across the wider Luton community which mean I fully support both the Power Court and Newlands Park proposals. What if this years rules had applied to the last 3 years Luton school league tables? Henry Stewart from the Local Schools Network has put a FOI into the DfE for the data showing how results from the past three years would look judged against this forthcoming criteria. I’ve copied and pasted the data for the Luton schools from those spreadsheets and added the full 5A*-C E&M (including equivalents) from the DfE performance table website. There is a fairly clear trend as the “gap” between the headline measure and the WOLF measure narrows across the schools in the 3 years to 2013. This direction of travel is a definitive positive as overall pass rates have remained high as the curriculums have become broader which, in turn, will mean that more Luton school leavers will have a wider range of Post 16 options available to them and be more likely to succeed on those pathways. It also means that the schools have the curriculum offers in place to be much better positioned for the bigger change to the league tables due to happen in 2016 with the introduction of Progress and Attainment 8. A common theme throughout all of the recent commentary on the state of CEIAG in schools has been that the publication of Destination statistics for all schools is a ‘good thing.’ In the modern world, the argument goes, transparency of outcomes for schools should not just rely on qualifications gained by students but on the stability and suitability of the progress those students then make in their first steps beyond the school gates. With this in mind I wanted to post something concentrating purely on the Destination Data of my own school’s leavers to show how this does and does not offer insight when looking at figures on a school size level. I’ll be using 4 sets of Destination data to give some context. Firstly, there is the data currently on the DfE performance tables website. This relates to our 2009/10 leavers. 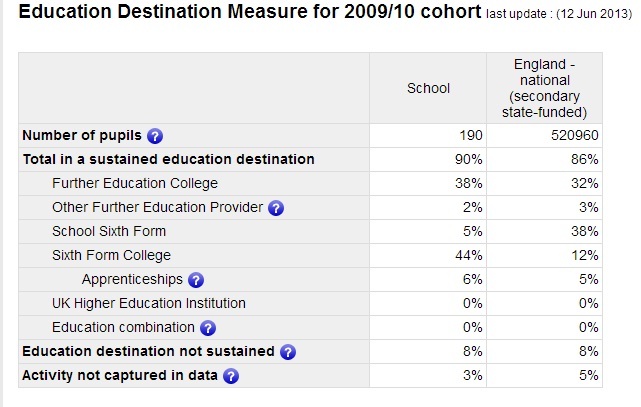 Second, is the data for the 2010/2011 cohort that is due to be published on the performance table site in June. So, what to notice between those two? The trend in our numbers to FE seem to be falling while the numbers to Sixth Form College are rising, Apprenticeships are steady and “Destinations not sustained” are falling. The FE and Sixth Form trends have the biggest swing in numbers so could tell the story of a more definitive trajectory. The Apprenticeships and Not Sustained numbers are pleasing but I’m wary of hanging out the bunting because, as you can see from the second table, the numbers of students involved are small. One or two students either way and those percentages alter significantly. A hugely important factor to bear in mind is that this data is based not on a snapshot but on an extended time period. As the guidance tells us Participation is determined as enrollment for “the first two terms (defined as October to March) of the year after the young person left KS4″ and not sustained destinations are defined as “young people who had participated at an education destination during the academic year but did not complete the required six months participation.” There is much to commend on the longer term measurement being used here which does more thoroughly test a school’s CEIAG legwork to suitably place their students post KS4. A negative consequence of this more considered approach though is the sheer amount of time that has to be allowed before publication to let the students travel through the system. The most recent set of data above covers students who left us 3 years ago. 3 years can be a lifetime of change in a school with new initiatives, new curriculum, staff turnover, Leadership changes, new priorities and events so to use this to judge that school in the here and now seems to be a little redundant. The third set of data for our 2011/2012 cohort is from our Local Authority, who, alongside their Youth Service partners, work their way through enrollment lists, phone calls and house visits to get all of the stats which the DfE then utilise in future. The first thing to notice is that some of the Destination terms are not the same. This immediately causes issues in comparison. Compared to the first two sets of data, the trend away from FE routes and towards Sixth Form (not differentiated between School Sixth Form and Sixth Form College here) reduces but continues. The NEET category (not known in the DfE data) is pleasing again (with the same caveat as above) while the Part Time Education numbers are odd and appear towards the larger end of the local spread (more about this below) but they lead to another concern; any conclusions we draw are only as sound as the data collection and entry job that went before them. The biggest difference in the data sets is that the Local Authority data is a snap shot taken on the 1st of November 2012, just a few short weeks after the GCSE results. If published then, the immediacy of this data could provide interested parties such as Ofsted or parents much more reactive numbers on which to judge local secondary schools but this immediacy could also cause problems. Any snap measurement could offer a warped view of a reality that would produce very different data if captured on a different date (were the statistics exactly the same on the 2nd of November?) and perhaps not highlight gradual drop out as those learners went through the first term of their KS5 routes. 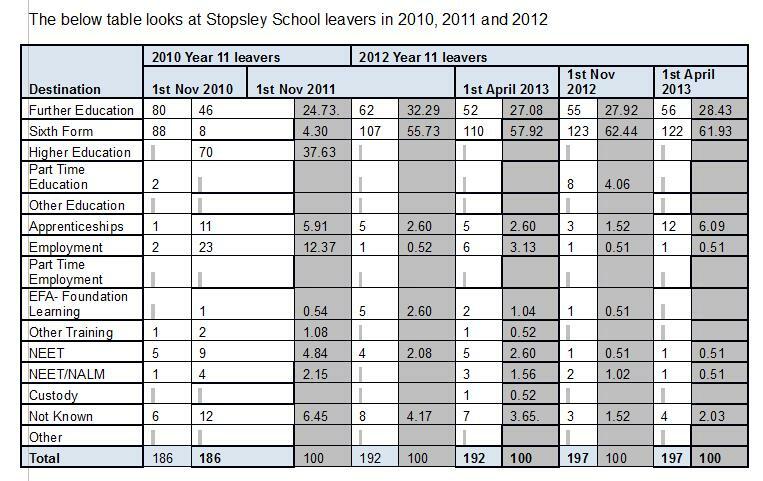 To combat this and to show trends the Authority repeat the exercise in the following April with the same year group and the results of this follow up snapshot for the 2012 leavers are in the columns on the right below. Clearly the largest change between the November and April is the Part time Education number now reads zero and the number of Apprenticeships has jumped by the same number to 12. How much of this change can be attributed to data entry decisions or to the steady progress of our leavers securing Apprenticeships in the year school would only be known to those with local knowledge of our alumni. It’s a tale not told in the stats. So, what can we learn from all this data? If Ofsted and stakeholders such as parents are to get the most out of Destination data in its current form, a considered and measured view and a desire to understand the stories behind the figures really will be required.